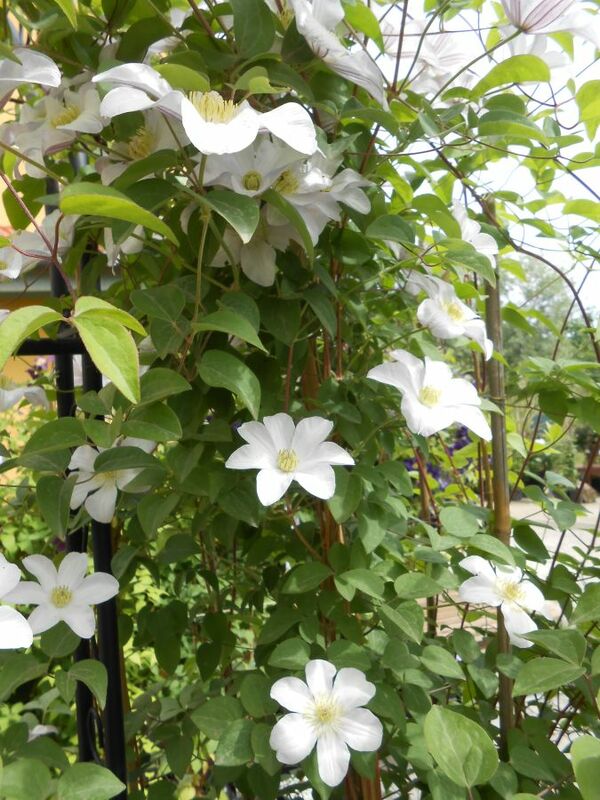 The Clematis Huldine (or viticella huldine) has masses of medium sized white flower from July to October. Huldine can be grown through trees and will reach heights of around 15 feet. 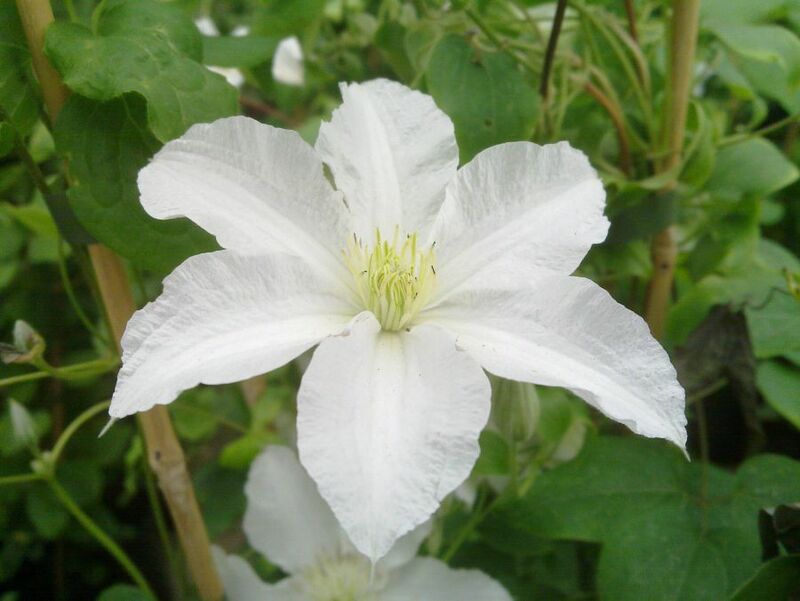 There are several late-blooming clematis with flowers whose undersides add noticeably to their ornamental effect -- 'Star of India' and 'Lilacina Floribunda' come readily to mind -- but there is probably no clematis better loved for this unusual feature than C. 'Huldine.' 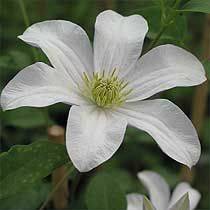 Its midsized flowers, with their six gracefully arching tepals and creamy center, are nearly always described as pearly white, and so they appear against a dark background. But they are translucent as well, and this gives them what might be described as their one-two punch. Plant the vine where the bloom can be seen at least sometimes with the sun behind it, and the flower shows off its right cross, the track of mauve at every midrib. There must be very few garden books that mention 'Huldine' and fail to point this out. Sun is important to 'Huldine' in another way. This is no vine for a shady site; the wood needs a long season of warmth and light to flower well. At maturity the plant can vary widely in size depending on its situation -- from 3.5 m. (12') up to 6 m. (20') -- and normally develops a considerable spread at the base. 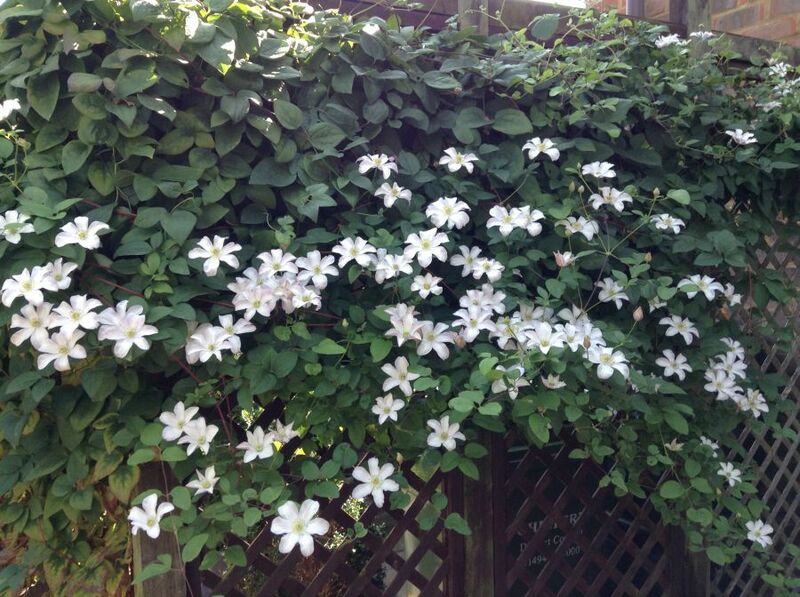 Since it blooms on its new wood, it can be hard-pruned like other Group 3 clematis in autumn or early Spring, but there are good advisers who favor waiting until the new growth is well advanced and making the cut higher up, so as to exert more control over the shape and mass of the flowering tops. Occasionally one hears of a plant of 'Huldine' that refuses to flower, or is erratic about its timing from one year to another. The fact that some specimens seem to have this oddity and others do not has led to a speculation that there may be two forms, or two cultivars, circulating under the same name. This may be so, and some few gardeners who bring home Dr. Jekyll could discover two years later that it is Mr. Hyde. But a first line of defense in any case is to give the plant plenty of sun, plenty of water, and plenty of time. 'Huldine' is of uncertain lineage, being one of many seedlings bred by Francisque Morel around 1900 and passed along to William Robinson and his staff at Gravetye Manor in England. First exhibited by Ernest Markham in 1934, it won the RHS Award of Merit, and despite occasional scarcity has been in production ever since. As to the name, speakers of English fall readily into "Hul-DEEN" or "HUL-deen". Magnus Johnson in Släktet Klematis takes it to be French and writes it "yldinn" (the y representing the distinctive French u). On the other hand Percy Picton, who must have heard and spoken the name a thousand times when he worked as a young man at Gravetye Manor, gave it three syllables -- in his soft Malvern-Hills sound, "Awl-DEE-ny" -- marking it as the diminutive of a German name: in effect, "Little Hulda". And that (allowing for some shaping up of the vowels) is the usual pronunciation in Germany. Fortunately they all come out the same on paper.